GlobalData has scored the world’s top 54 servers, storage and networking companies on their leadership in the 10 themes that matter most for the industry. These companies comprise the leading listed vendors of servers, storage devices, networking and telecom equipment as well as providers of network management products. Alphabet has been ranked as a leader in most of these areas meaning it is ideally positioned to perform well in the future. In second place was Intel, followed by Amazon. Notes: * Market capitalisation as at December 2018. 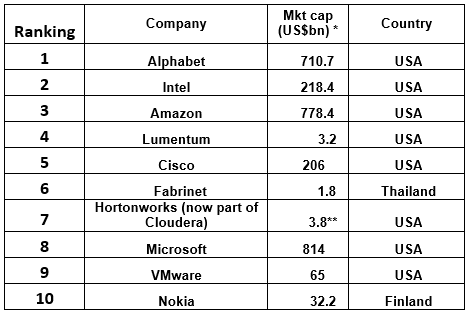 ** This is Cloudera’s market capitalisation as of 28 February. Hortonworks completed a merger with Cloudera in January 2019. The hyperscale data centres run by the likes of Amazon and Microsoft are increasingly deploying custom server hardware and networking kit from smaller suppliers like Arista rather than purchasing end-to-end solutions from big suppliers like Cisco. The evolution towards software-defined everything presents challenges for the traditional hardware vendors, who need to manage a transition from a hardware-based proposition towards one that is largely vested in their software capabilities. Equipment vendors will need to ensure that their products support the growing interest in AI, both among carriers and business customers. They will need to address growing AI adoption in the Internet of Things (IoT) solutions, such as smart cities and smart homes, increased interest in AI at the edge (for greater security and improved latency) as well as AI adoption for improved network management. Equipment vendors that do not embrace and incorporate the technology into their operational plan and product roadmap will fall behind their AI-savvy rivals. In the connectivity layer of IoT, vendors such as Ericsson, Cisco and Qualcomm are quite influential in the standards-setting process. Once a common standard emerges, profits could flow disproportionately to the winning standard-setters. With cellular networks onboarding LTE-M, 5G and NB-IoT connectivity, there is a high demand for connectivity networking hardware. With an increasingly connected world, this is a trend that is likely to continue. However, software-defined networking may limit this market in the longer term. Enterprise SDN adoption is currently in a lull, with only Cisco and VMware announcing significant numbers of production customers. However, the SDN market is expected to evolve quickly as vendors adapt their strategies to a changing landscape. Key to their strategic success will be the ecosystems vendors can develop or participate in, because networking involves products in adjacent markets like application delivery controllers and security. For many enterprises, network automation, not SDN, will be more valuable in the long run. Hadoop has gotten a bit of a bad rap over the last few years, becoming an overly complex solution. First, depending on the use case at hand, Hadoop may depend on many supportive technologies such as Apache Spark, Yarn, Pig and Hive, each of which demands some degree of domain expertise from IT buyers. Second, owing to its popularity, the competitive marketplace has become saturated by both competing Hadoop distributions as well as platform-specific competitors like Google BigQuery, all equally handling large volumes of disparate data at speed. This innately complex market coupled with a move towards hybrid – and multi-cloud – data requirements will push vendors to shift their focus away from discrete data storage to a more holistic, unified platform view of data management, integration and governance that equally spans premises, edge and cloud. 1. Vulnerable: The company’s activity with regards to this theme will be highly detrimental to its future performance. 2. Follower: The company’s activity with regards to this theme will be detrimental to its future performance. 3. Neutral: The company’s activity with regards to this theme will have a negligible impact on the company’s future performance, or this theme is not currently relevant for this company. 4. Leader: The company is a market leader in this theme. The company’s activity with regards to this theme will improve its future performance. 5. Dominant: The company is a dominant player in this theme. The company’s activity with regards to this theme will significantly improve its future performance. This article is extracted from GlobalData’s Technology, Media and Telecoms Predictions 2019 report and was first published on Verdict. They are part of the same group as NS Tech.